Over the years, Glendale has flourished into a major urban hub. However, today’s eclectic mix of homes has its roots in the early days of the city’s history. With so many historic neighborhoods such as Cottage Grove, Rossmoyne, Royal Boulevard, and Brockmont Park, it’s easy to see the distinctive features of these incredible homes. Many original architectural styles are still prominent in the city of Glendale, making it such a unique city to live in. Various features of Spanish Colonial Revival, Tudor Revival, and French-inspired designs are still seen in the homes today. Many residences within Glendale are ready for some major home remodeling projects and large-scale renovations. As expert Design Build Remodelers and Custom Home Builders, HartmanBaldwin can help with any project varying from Whole Home Redesigns, Major Home Expansions, Kitchen & Bathroom Remodels, Second Story Additions, Master Suites Expansions, and Custom Home Building. 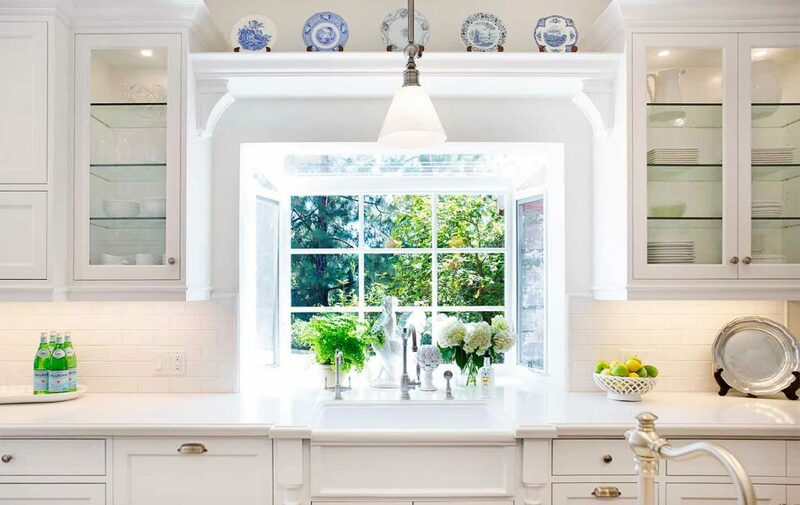 This remodel highlights our clients’ interior palette of crisp whites and vibrant hues. 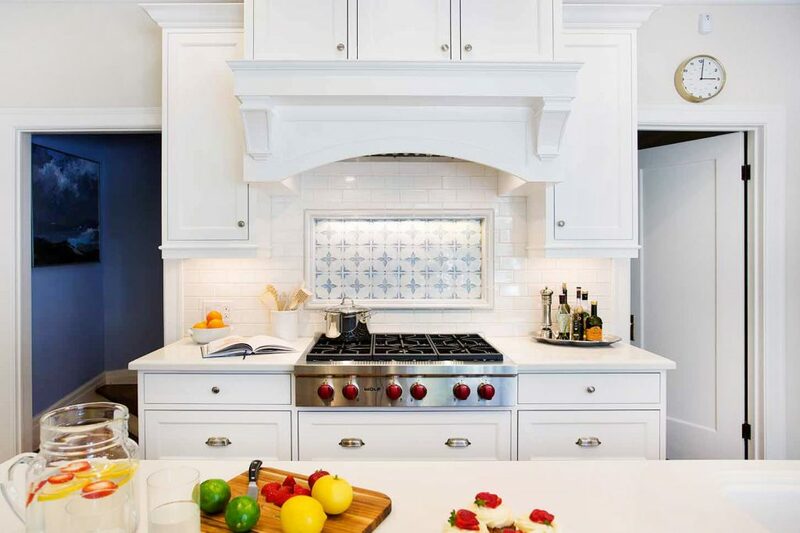 The classic detailing in the kitchen cabinetry accentuates the decorative tile backsplash of the range. 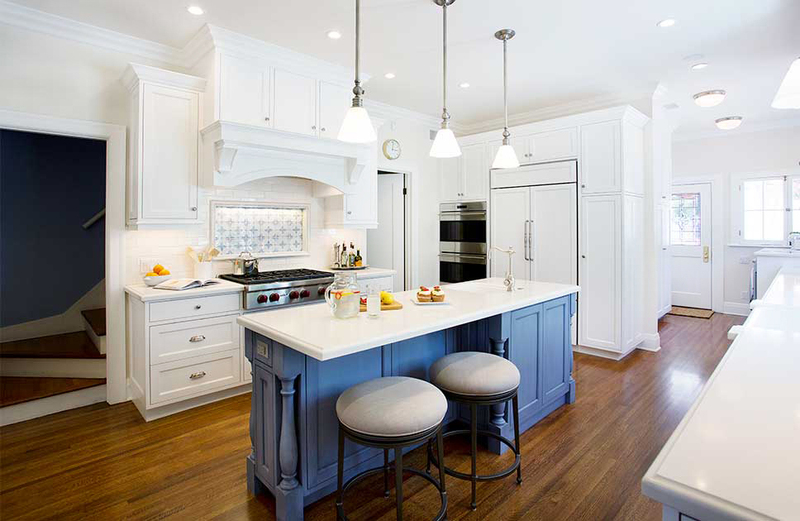 The kitchen island is fashioned in a classic style and anchors the surrounding white cabinetry by its attractive blue color. The kitchen is now both a beautiful and functional space that maximizes the square footage while streamlining and subtly delineating work areas. This is just one example of the many ongoing Design Build Projects in Glendale. As expert Custom Home Builders, let us show you how to get the most of your new home. Our finely tuned Design Build process, makes us the residential design build firm for you and your next remodeling endeavor.